When I first posted this graphic on Facebook I had no idea it would ignite such strong feelings for so many people. It seems my first financial lesson of 2018 is that money triggers many different things for many different people. Clickbait Spoiler Alert: I will not be giving you “the” formula to make $50,000 in a month. tl;dr: You have to start somewhere. THIS is your somewhere. After chatting with a coaching client, I was breaking down the idea that you can’t just jump from $500 a month to $50,000 without focus. One thing my clients will tell you is that I push them on increasing prices. “ADD A ZERO” is one of my favorite phrases. “Every x clients, increase your fee” is another. This is pretty much the only financial coaching I have given. It was always more of a courage exercise than a money one. Stronger financial understanding is on my own 2018 to-do list, and it’s natural that I extend that to my coachees. As sometimes happens, my client was spiraling about “I don’t know how to get there” and “it will take too long.” As I’m walking her through ways to earn more by increasing her family’s involvement and reducing her own hours, it dawned on me that her fear is MONEY, not her family (well, it is family to some extent.) Money seemed so big and far away and unattainable. When money is tied to hours, you cannot make more money because you cannot make more time. Note: I’m a fan of passive reoccurring income. I will no longer trade my time for money. What happens when you run out of time? YOU RUN OUT OF MONEY. My view is that the key to the whole treasure box is to do the work ONE TIME and sell it MANY TIMES with the support and collaboration of your family. I’ve not seen an industry or a person that does not have the potential to make unlimited income. Back to my lovely client: I quickly made a spreadsheet on my tablet doing the “backward math” and figuring out that if her “plucked from thin air” goal is to make $50,000 a month by December, how much would she need to make in January? $25 in January, doubled month after month, will bring you $50,000 in December and nearly $100,000 altogether for 2018. Even if you can’t double money month after month, it is still worth working toward. So what if you only double your money every six months? Who cares if you can only make a 14% increase month over month? So what if you slip up a few months in a row? You are missing the entire point of the thought exercise. Plan. Action. Focus. That which is not measured is not improved. I thought the little graphic was cute, even if sloppily screen captured, and decided to share it online. I was NOT expecting what came next. There is no “get rich quick” plan to have it double month after month. There is no one thing, no one “job,” no one opportunity can double money month after month. There are no stocks, no real estate, no cryptocurrency, no MLM, no lottery, can double your money month after month. 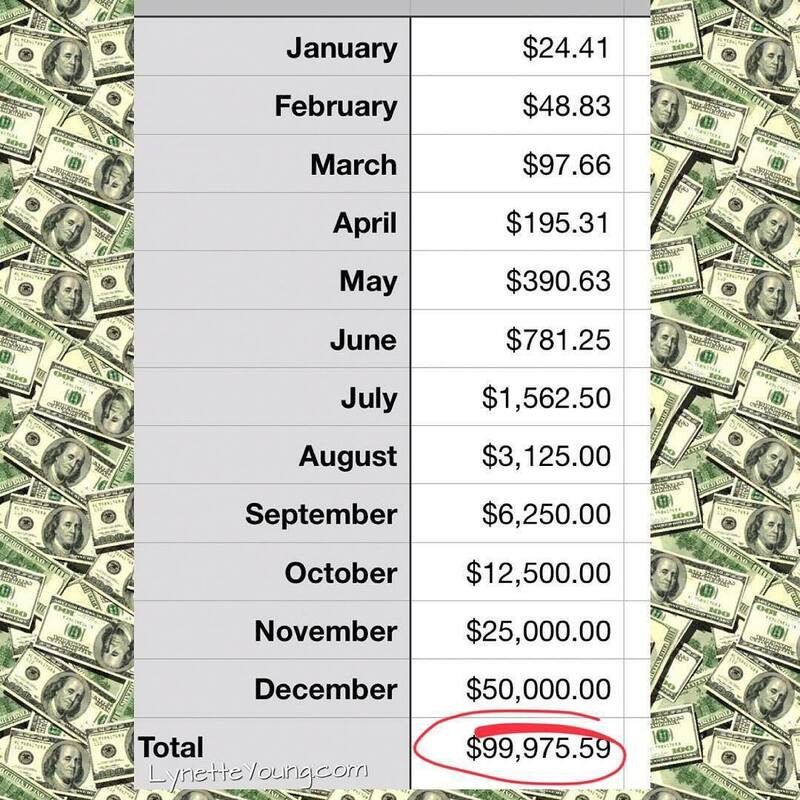 I see (and hear from) SO.MANY.PEOPLE because of this graphic begging me to tell them how to make $25 into $100k in one year. They have “tried everything” and still have no wealth. No, you haven’t “tried everything.” If you have, I’d see a trail of tried-but-failed entrepreneurial endeavors behind you or a series of careers. Instead, I see *sameness* throughout your journey. I see a toe dipped in water and quickly pulled back out. I see false starts. I have worked at an insurance rating company. I have worked at pharmaceutical companies. I have worked at financial companies. I have worked at technology companies. I have worked at an ice cream parlor. I have worked at a tow truck company. I have worked as an adjunct professor. I have worked as a project manager consultant. I have owned a paper crafting retail store. I have owned a digital marketing agency. I have owned numerous direct sales downlines. I have owned a podcast production company. I currently co-own a software company. I currently own a coaching business. THAT is what it looks like to keep trying. No one wants to hear about the work. No one wants to hear about the time. No one wants to hear about the baby steps. No one wants to hear about the failures. No one wants to hear they will have to try new things that trigger impostor syndrome. No one wants to hear about anything but the exact right easy way to do the thing right now. Work. Creativity. Focus. That’s the answer. It takes doing a LOT of different things all at once to find what works. What works for you or for me will not work for others. If you are looking for help figuring out what might work for you, I can help. Just know you will have to try things that rip you out of your comfort zone. THAT is the true cost of money. The responses I received on Facebook were very enlightening. Every single one of the people that left comments did so as a direct result of how they personally interact with money and their experiences with it to date. My outlook and experiences are not the same as theirs. That does not mean that their feelings around money are wrong. It only means that what they believe becomes their truth. Just because it isn’t true for you does not mean it is not true for others. Just because you don’t see it in your life does not mean it is not in the lives of others. Just because you have not reached the goal does not mean others also have not. I’m not a money coach (but have a feeling I will be…) As of yesterday, I have been incorporating it more heavily in my work. Keep doubling your prices for each client, hour of work, or ‘thing’ that you sell. Chances are the market will not support “adding a few zeros” onto your price (say, going from $50 to $5,000 by “adding two zeros”) just so you can make more money. Hire people to work for you, but then you would need likely hundreds if not thousands to make the money depending on your goals. Go back in time and purchase Apple stocks, invent Bitcoin, or marry that millionaire. Create something that you can make/do ONCE and sell it multiple times. Authors do this with books. Teachers do this with courses. Software companies do this with SaaS (software as a service/subscription model). SO.MANY.PEOPLE. cannot see outside of what they currently do for money PER HOUR to know that income does not have to be limited time/money. Manifesting. There. I said it. A few people identified my money doubling graphic as manifestation, which is partly true. I purposely did not use the word, but when it was brought up… well… take a guess what happened next. If that is what YOU think manifesting is for YOU, then you are right. But that is not what it means to others. We use manifestation to plan, to move to action, to focus. If you study what manifesting actually is and how to do it, it looks very much like prayer. No faith-filled person will tell you that they just throw their hands up in the air and “let God take care of it” unless it is something truly out of reach for mortals. (I’ve added my voice to many prayer circle requests, it is powerful.) You have to meet God halfway. Ain’t no one praying for a better job or a better partner while simultaneously mouthing off to their boss or cheating on the partner and expecting God to drop down from above and wave His hand over you and FIX IT. You need to do the work. People pray for clarity. People pray for focus. People pray for guidance. People pray for inspiration. That is exactly what people use manifestation for. Look at it this way, when someone says they take NyQuil for a cold and it works, then you take it and it doesn’t – does that mean the medicine is garbage? No. It simply means it did not work for you. Denise says try everything. If you need help figuring out what “everything” means (within legal and moral confines lol) get a coach. It may be me. It may be another coach. Get help. Money can be scary. It is triggering. As I’ve quickly learned in my 2018 journey to understand and attract it, I’ve seen that money has power. In that infamous Facebook post, I compared money to electricity – I view money as energy. Money is an energy that we exchange for other things, just like a plug in a socket. It powers other things. What you choose to plug in and how it gets powered is up to you. Energy unfocused is static electricity showing up randomly when you least expect it. Energy focused is lightning showing up in a precise and powerful way. Which one of those is going to power your dreams?